Google Now on Android has always kept track of your activity to one extent or another. It will even incorporate previously search items into the cards. Google Now will also automatically measure how long your commute to and from work or school will be. 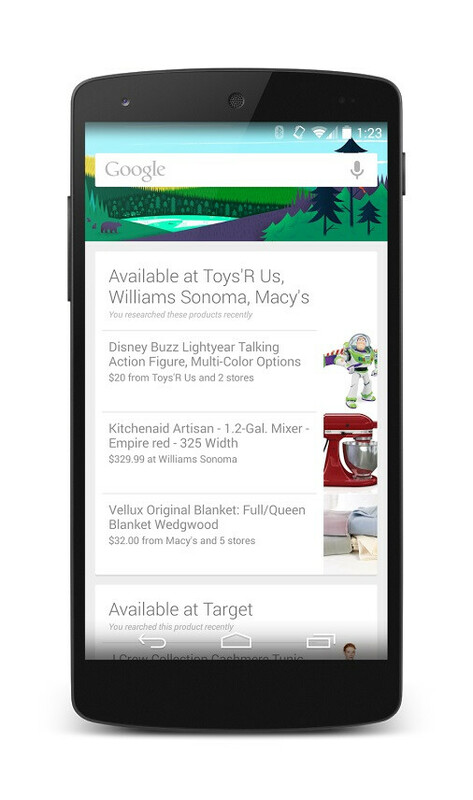 Now, using location data, Google Now will also let you know when items you have searched for in the past are available from nearby retailers or service providers. Google uses the example of someone who searches for hiking boots, but has not actually gone to the store to pick some up. The next time that person is out shopping somewhere that happens to be near a store that sells the boots being searched, Google Now will throw out a card to let you know. What we do not know is how long Google Now will remember the products, or if it limits how many items are actually tracked. The cards will provide the store location and the cost of the item. It is probably just a matter of time before we start getting information about whether or not the products we search are in stock or not. Thank you Google! The line between creepy and usefulness is comepletely being blurred and erased all by Google it self. This is why Google now is the the top assistant. Miles ahead of the competition. Google now isn't the top assistant in my opinion, Coryana is the best of Google now and Siri along with its own unique taste. But it can't set reminders.... lol. Or have they figured out how to fix that one yet? No surprisingly. How would any voice assistance reach perfection in day one? Microsoft developed the Swiss Cheese OS called Windows. Swiss Cheese OS, full of holes. What the hell is "Coryana"? Do you mean "Cortana"? How exactly are they better? Yeah right, you're just biased. And this is a perfect example of what smartphones are suppose to do for the user. Apple, Microsoft, take notes. I welcome this feature, if it helps me find goodies as said, it'll be handy for me. Because every American needs a Google bot to tell them to buy more stuff. Am I the only one who's disturbed by this? Google learning our spending pattern is too personal. That's data companies would pay huge money for. This sort of thing has been going on for many years. Google's mission in life is to know everything about everyone. Google is the data company to end all data companies. Ever heard of "Google Wallet"? https://checkout.google.com/ Or Google "Trusted Stores"?http://www.google.com/trustedstores/ Use either of these and Google knows everything about your shopping habits. The latter is especially sneaky as many stores don't make it visible that they are a Google trusted store. Them having the information is nothing new, them making the information work for the user's benefit like they are for Google Now is the only justified reason for collecting it in the first place. Both Microsoft and Apple collect the same kind of data, they just haven't given their users any justification as to why they need it yet, as it hasn't improved the functionality of their devices. Dont bring logic into these debates...whats wrong with you.... MS does justify it with hotmail/outlook.com....they have ads in the email based on search, browser history... This lil tidbit of info always get overlooked by the anti Google folks tho.. Sorry about that. I forgot where I was for a moment. its only for USA and its territories not for Europe until now. It will take time to come in other regions ! !